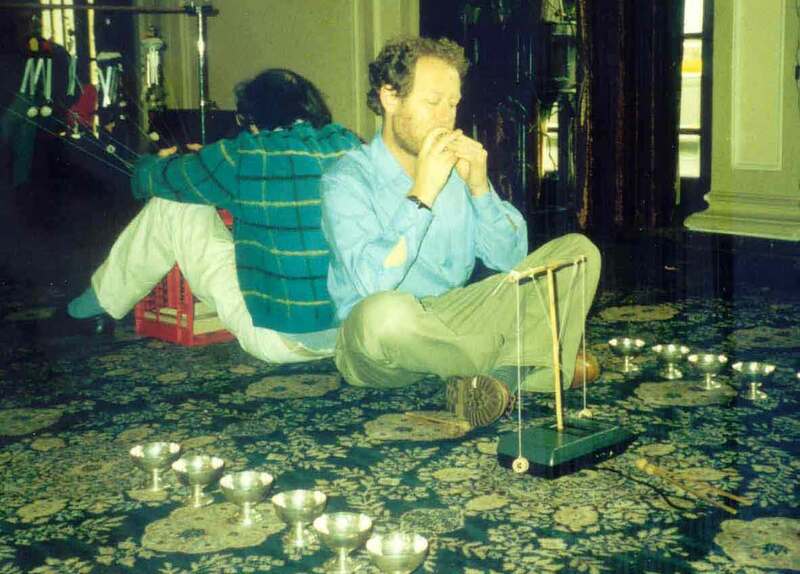 Ernie Althoff is a Melbourne sound artist and instrument maker active in Australian experimental music since the late 1970s. He is unique not only for the original textures and sonic elements he creates, often tempered with wry humour, but also for his practically continuous contribution to and participation in the Melbourne experimental music community for over three decades, from a regular performer at the Clifton Hill Community Music Centre in the 1970s/early 1980s, right through to his participation in the inaugural Hmm...Hand Made Music Festival in 2011. Althoff released four solo cassettes from 1985 to 1992, now all sold out. Shame File Music presents here online reissues of each cassette, complete with cover art, original liner notes and Althoff's thoughts on these recordings today, all for free download/streaming. When the 1985 cassette edition of The Way I See It finally sold out in 2011 and a free download format was suggested, I faced the dilemma of the works still being available but in a totally inappropriate context (the text refers to cassette media 54 times), or letting the works go out of print despite strong email demand. Releasing another cassette edition would be too costly and cumbersome. At the time of writing the works (1984), I was hearing a diverse discourse on the role of the listener and the supposed 'finished realisation' of a recorded work, even among my peers which had been centred around the Clifton Hill Community Music Centre. Musicians from other musical disciplines also had differing opinions. I personally surprised myself by admitting that I was able to concentrate and enjoy recorded music to a fine level whilst ironing clothes, with the ironing board positioned at centre stereo field. Probably not what many composers envisage from the recording studio! Music machines of the rotating T-arm type started to appear in my work from about 1983. 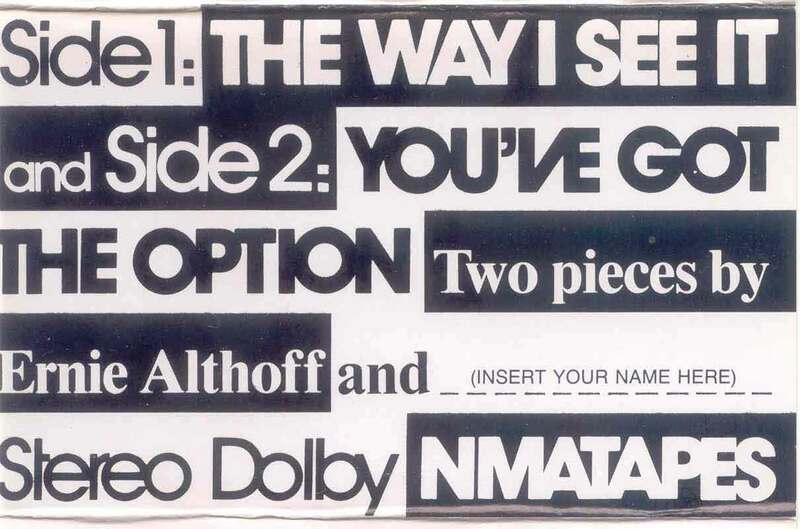 Their earliest recorded form features on NMATAPES2 (1983). Their simplicity and their beautiful randomness greatly appealed to me. By the time of recording these works, the processes of sound selection and their placement in the circular field were well honed. "You've Got The Option" (originally Side 2) features a text, cymbals, twelve dessert bowls, two half-speed toy accordions, and an electronic pulse made by connecting the line-out from an old Geloso mixer back into a microphone input. I might have gone down the road leading to the no-input mixer skills of today, but I liked the visual/kinetic thing too much! Of course, this is just form-and-structure trivia, and does nothing to the audio-experience of the piece. It is, however, the same structure used for YOU'VE GOT THE OPTION. Here, the percussion has been replaced by a drone made up of electronics and 2 half-speed accordions. The 3 categories are now: (1) Bowls, (2) Text, and (3) Cymbals, and follow an intro in a timed pattern closely related to that of Side 1. So, as can now be seen, the 2 pieces are united in form and structure, and also in intent and purpose. Finally, considering that the options really are yours, I hope you enjoy them. THE WAY I SEE IT was written in June '84, and YOU'VE GOT THE OPTION in August '84. Both were recorded and mixed December '84 to January '85 by Rainer Linz, acting as both engineer and producer with Ernie Althoff. Thanks go to Rainer for his enthusiasm and invaluable help throughout this project. Thanks also go to Les Gilbert and Julian Driscoll for the loan of microphones and a mixer, and to Chris Mann for his initial support for the project and reading the score. Cover designed by Ernie Althoff, and printed at Backyard Press, Prahran, Victoria. This is an independent production, with no support whatsoever from funding bodies or organizations. All known copyrights apply. 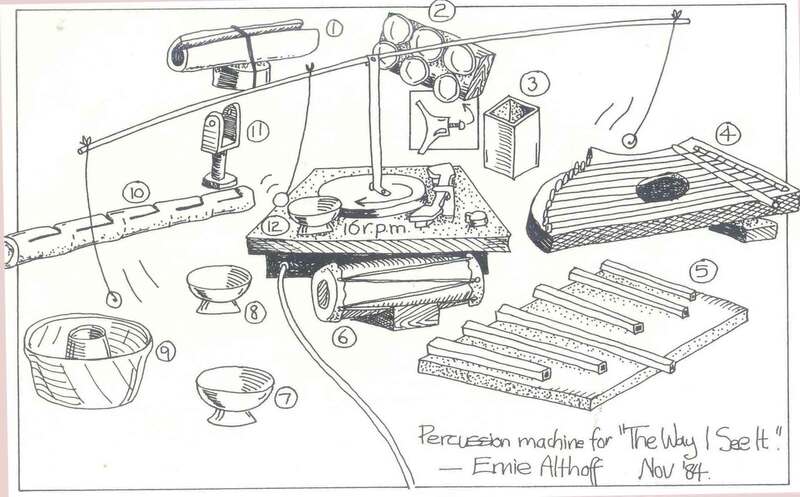 Review: Experimental Musical Instruments, Volume 2 Number 6, April 1987, p 19. I would love to try and write about this cassette in a spirit that is appropriate to its contents. I couldn't possibly. Why? Because it is so profoundly peculiar. It is enjoyable, aggravating, challenging, off-putting and VERY funny in a completely idiosyncratic way. I should probably stop there and say "if that intrigues you, buy the tape." But I will say a little more about it. It is Side 1 of the tape that gives it most of its character. Side 1 contains the piece "The Way I See It". 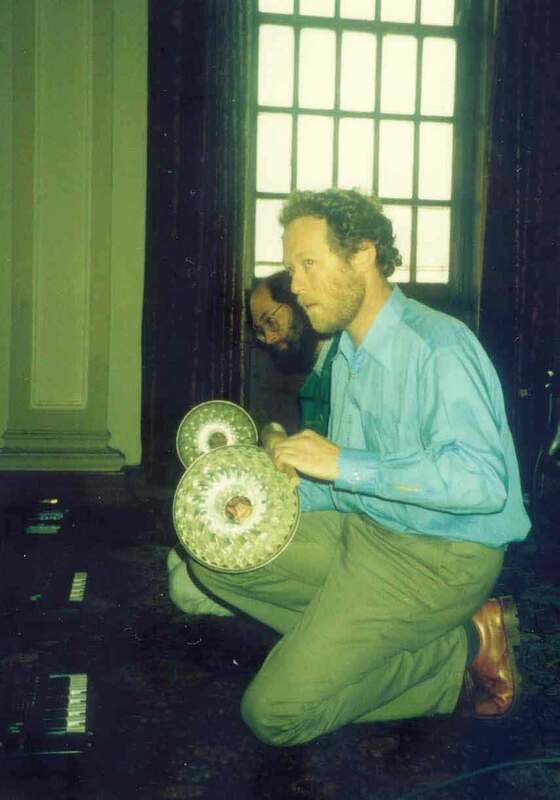 The sounds of "The Way I See It" are produced by a random music machine devised by Ernie Althoff , occasional sparse drum overdubs, and a spoken text. I will not attempt to describe the text. The random music machine is an automatic percussion device, playing continuously through the piece. The sounding elements are a dozen miscellaneous objects - some found, some contrived in various simple ways, and some actually bought as cheap musical instruments. Included are kitchen utensils, door handles, a small prepared zither, a toy drum, a casually made conduit marimba, and other odds and ends. They are scattered about on the floor or a table around the kinetic heart of the arrangement, which is an old turntable running at 16 rpm. The turntable rotates an upright post with two horizontal arms forming a T at the top. Hanging by strings from these arms at various points are a ping pong ball and two wooden beads. As they slowly circle they bonk the pots and pans, the zither, the toy drum, in completely random patterns. Each collision causes them to bounce off in some new elliptical orbit, later to strike something else and bounce again. Althoff has arranged things so that the machine's pace of events is continuous but not crowded, inviting the listener to search for patterns that don't exist. The net effect is rather pretty actually, and also potentially rather maddening. As an environment in which to hear Althoff's eccentric text it seems strangely appropriate, both in its sonic relationship to Althoff's voice, and in the suggestion of an elusive order in randomness. Side 2 of the tape is "You've Got The Option". It provides an effective sonic contrast to "The Way I See It", though it is not as engaging in itself. It too uses a text riding on an odd, continuing musical environment, in this case provided by electronics, two half-speed accordions and some metal percussion. 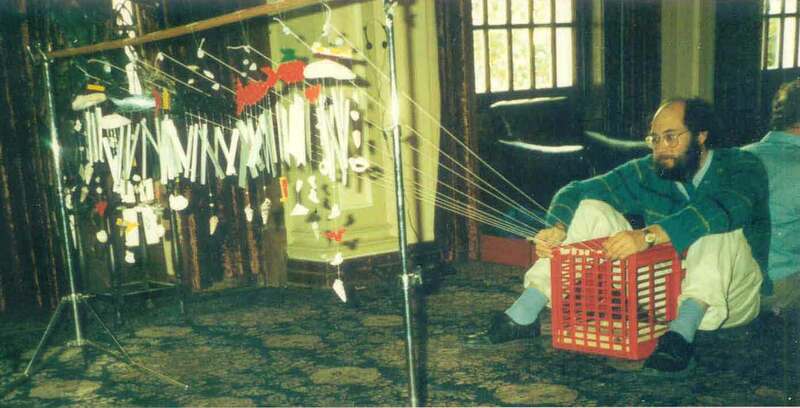 In recent years Ernie Althoff has built a number of music machines similar in spirit to the ones used in "The Way I See It". Most of them use or misuse cheap electronics, toy instruments and household items in conjunction with unlikely signal paths to produce quirky sounds with varying degrees of controllability. Some of these machines have been described, with friendly cartoon-like illustrations, in two Australian music publications: NMA 2, published by NMA, and AMC News 9, Spring 1985, available from the Australian Music Centre. Turntable rotating at 16 r.p.m. swings arm-attachment around and around. Ping-pong ball is suspended near vertical support, and two wooden beads are suspended at the ends. The objects get hit, and the beads follow erratic, elliptical paths. 1. Bamboo woodblock rubber-banded to tin can. 2. Metal cupboard door handles bolted to a wood block. 3. Piece of square-section aluminium tube. 4. Propped-up zither, prepared with metal rod threaded through strings. 5. Series of square-section aluminium rods of different lengths (window frames, I think), resting on foam rubber (NOT A RECOGNIZED SCALE). 6. Small Indian drum of tourist quality. 12. Another EPNS dessert bowl. Bought as instruments: 4.6. Home-made: 1.2.3.10. Found objects: 3.7.8.9.11.12. My photograph archives show some of the machines featured here used in live performances (1987-88), and I've also located sketches of two of the machines from late 1986. Often I would draw these, with all the relevant parts arrowed and labelled, on 1/3 A4 pieces of card. These then served as a kind of 'score' and parts-list for the machines' multiple appearances. Machines 2, 4 and 6 all use the rotating T-arm and suspended beaters system I'd been using for some years now (Machine 4 uses a cassette player as its motor, and so rotates in the opposite direction to the record player turntables used for the others). Like the machine used for "The Way I See It", the sonic arrays were mostly multi-timbral in the broadest sense, but in 1986 a scrap metal dealer noticed me hitting things in his shop and asked if I was interested in a box of old cymbals he had at home. The price was right, and I became the owner of a new resource. I'd take along a different few to every event, and learnt how much variation there was in the sounds of cymbals, even crappy ones like mine. Making a machine that played just cymbals was a natural progression. This machine (Machine 4) and the rolling roar of Machine 1 started this project. Keeping to a metals consistency seemed a good idea. Also relevant was my newly acquired Fostex X-15 4-track cassette recorder, which enabled me to plan a piece that faded one stereo pair of tracks over to another pair. Eventually it was titled "Parade" because of the processional aspect; at that time I did not know of Erik Satie's piece. I had a workroom in my house that became the recording studio. I learned about the jarring impact of percussive transients on electret condenser microphones placed too close. I recorded late at night to minimize the background hum of traffic. I built an elaborate rig with blankets to record Machine 5. I got there. I'd always liked permutations and combinations from high-school mathematics. With four tracks and seven machines, sorting out the 35 ways of selecting four from seven was easy. To avoid the the big timbral shock of four simultaneous changes, I moved the blocks on the score out of alignment. It began to look like a low brick garden fence from the 1960s - hence the "Bricklaying" title. To add dynamic interest, I included a system of up to three preset volume changes per block (e.g. one change: Vv, two changes: vVv, three changes: vVvV). I think this works very well; after 21 years it's still such a surprise when that little pitch-bent tin can sound leaps out at you! This is textural complexity of which I never tire! Why didn't I reveal that the machines' motors were record player turntables and a cassette player in the program notes? I seem to awfully coy about this, referring only to "things rotating". Even the platter mat of Machine 3 is just called a "rotating rubber mat". OK, now I've come clean! 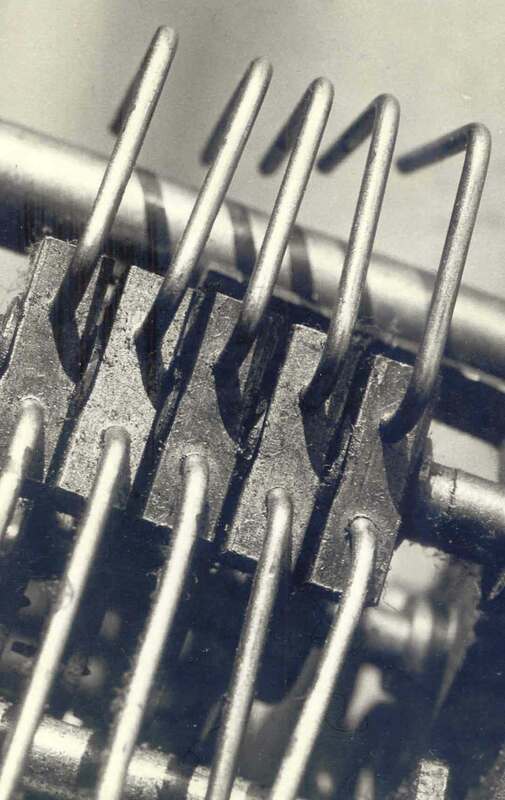 The cassette's cover photograph shows a part of the striking mechanism of a wooden-cased mantel clock. It was taken in 1971 for a graphic design project. 1. Four table tennis balls roll on a rotating metal hot water services lid. A contact-miked bamboo pole positioned like a billiard cue just inside the lid's rim knocks the balls apart when they congregate there. 2. Two wooden beads suspended from a rotating T-arm structure strike 25 tin cans placed in their path. The cans are of different sizes and open or closed. They rest on their sides or ends to maximise pitch and timbral variety. 3. A rotating rubber mat rubs the tightly spiralled end of a suspended contact-miked clock spring. Another shorter clock spring, also contact-miked, hangs alongside and bumps against the first vibrating spring. 4. Two bamboo sticks suspended from a rotating T-arm structure strike the edges of eight cymbals positioned on cardboard cones around the motor. The sticks also bounce off to strike the motor's plastic case. 5. An off-centre post on a rotating turntable pulls a string to set eight tubular aluminium chimes in motion. A wooden bead hangs between each pair of chimes, preventing them from striking each other. 6. Two bamboo sticks suspended from a rotating T-arm structure strike eight aluminium cooking pots (sans handles) in their path. Sometimes a stick bounces across the top of a pot, striking it on both the outer and inner edges. 7. A rotating leather strip rubs the edges of two suspended aluminium rectangles. A suspended wooden cotton reel also strikes a piece of rotating hollow square-section aluminium mounted at the turntable's centre. PARADE is basically a showpiece: each machine approaches from the right, plays solo, moves left and duets with the following machine, and finally fades out to leave 'centre stage' for its successor. BRICKLAYING uses all 35 ways of selecting four machines out of seven in equal time segments. The title is derived from the overlapping structure of the units on the four-part linear notation. Both pieces were recorded at home using simple means, and are presented here with Dolby B and in reasonable stereo. Review: Sounds Australian No. 27, September 1990, p 39. Ernie Althoff is another composer who has taken to producing his own albums. This cassette, in addition to its musical merits, is an audiophile's delight. I have seldom heard percussion sounds recorded so lusciously as they are here, and the miracle is that Althoff recorded them in his workroom at home with domestic equipment. The extreme care and fastidiousness of his recording technique paid off handsomely. If you have any interest in contemporary music for percussion, this album is a must. For the past 10 years Althoff has been designing and installing “music machines”, self-playing sound sculptures that use cast-off turntables as their power sources. Various percussion instruments are placed around the turntable, and beaters are attached to the turntable in such a way that they swing freely after striking the instruments. Thus, the functioning of the machine is predictable, but perpetually random. This album features seven different sculptures, all of which use metal as their sound sources. Side one, Parade, displays the machines mostly one at a time. Side two, Bricklaying, has a more complex, layered structure. With his elegant use of chance, and his extremely refined timbral ear, Althoff has produced an extremely attractive album. Review: Retrofuturism No. 14, January 1991, p 1165. This work amounts to a demo by Mr. Althoff of seven of the self-playing machines he has built over the years. Mr. Althoff's machines are indeed self-playing; all he needs to do is set them up, turn them on, and listen. Most of the sounds are generated by metal percussion and are what math types might call "chaotic"; for a contraption such as Machine #1, described as "... four table tennis balls roll on a rotating metal hot water service lid. A contact-miked bamboo pole positioned … just inside the lid's rim knocks the balls apart when they congregate there ...", the sounds generated are always self-similar but never repeated exactly. It seems Mr. Althoff builds non-deterministic music boxes. The machines are presented in two ways. On Side one, Parade, each machine enters the stereo field from the left, plays along with the previous instrument (then by itself as the previous instrument leaves), and eventually exits on the right (sic)*. As each machine is presented, its sonic characteristics are easily recognisable (you think "Yeah, I guess that's what that contraption ought to sound like..."), and yet their common characteristics (metallic quality, disorderliness - yet predictability - and an odd familiarity) remain. On Side two, Bricklaying, the mix segues each possible combination of four Althoff instruments in overlapping segments. Here, the distinctive voices of each instrument merge, and the entrances and exits of each one's voice into the collective din inform the overall dynamic. Impressive. The liner notes are good too. On 15 March 1987, I sat on the sun-drenched bank of the Yarra River near the Fairfield Park boat house, making a recording with my SonyPro Walkman and Aiwa binaural headset microphones. Not overly high-end equipment, but good enough to capture a diverse and interesting soundscape: the high-pitched ringing calls of bellbirds, the distant whine of a chainsaw and other woodwork sounds, a light aircraft, children calling, dogs barking, and the 'clunk' of oars in the rowlocks of pleasure craft on the river. I later noticed how similar in timbre the bellbird calls sounded to some of the aluminum extrusion windchimes I'd recently been making. When I was asked by my local council community arts officer if I'd like to perform something for the Malvern Community Arts Festival on 24 May 1987, I decided to write a piece using this similarity. As a venue, I was offered the upstairs foyer in the Town Hall; a long, window-lined space with a worn but still elegant blue carpet. I asked Warren Burt if he'd be the second performer for me and he agreed. In this case, the title came almost before the piece. The live version of "For two on blue" became a progression by the duo down the long space, performing the next section of the work (each section having a lower pitch range than the previous) after a relocation. I wanted the work to be an additive accumulation as well, and my answer to this was to use some of my machines to play on after the performers had moved, or to be a final addition, as in the case of the tin cans machine at the end. As well as manual and mechanical sound-making, the piece also included two four-note canons made by digitally sampling percussive sounds onto the new Casio SK-1 portable keyboards that both Warren and I owned. Cutting edge, low budget technology! Warren really liked the piece, and when he became Composer in residence with the ABC Broadcast Music Department later that year, "For two on blue" was selected to be recorded in an ABC studio for eventual broadcast, along with works by Burt, Rainer Linz, Chris Mann and Amanda Stewart. Having a piece recorded on 16-track (still analogue in those days) equipment by professional, enthusiastic and co-operative engineers is always a joy. Having performed the piece live, I knew how it worked and it was relatively simple to convert it to a studio environment. This, plus the structure of the work's additive pitch groups, means that the bellbird calls ring clearly right through to the end of the work. The recording date was 23 September 1987, and the piece went to air on ABC-FM's Audio Spectrum program on 24 November 1987. "Saturday stories" had a somewhat more bumpy (in places) ride to its eventual presentation. As the text describes, in August 1987 I was asked by an ABC producer for a work to be played on a Saturday morning program on the AM band. When I enquired about the listening context in order to inform the piece (that's the way I work), the program was described as a bit of a soft background to mundane Saturday morning activities, so (and I quote) "...please, nothing too esoteric." Now we can go in two directions here. We can veer to a path where the composer utilises all at his disposal to make a constructive and self-instructive work; or we can witness the composer, slighted at his 'pearls' being undervalued, extracting a snide and sarcastic revenge! After the producer heard the finished product, the latter was unfortunately assumed and the work was rejected. Luckily, Warren Burt's Composer in residence position rescued the piece, and it too was played on the 24 November Audio Spectrum program on ABC-FM. The quirkiness of the text and its structure owe a good deal to the 'propositional linguistics' practices of Chris Mann, who taught me to be brave, from both observation and collaboration. The piece was written directly for a studio environment. The ABC engineer looked at my linear score showing the different channels of sounds as I envisaged them, and suggested a three-stage approach to the job. First we recorded the background texture: the table tennis balls machine (Machine 1 on "Music for seven metal machines") in the studio, a cassette tape (percussion using the metal slatted front of a gas wall-furnace) into the desk, and me playing samples on my Casio SK-1 also straight into the desk. The second layer was the text: me reading in the studio. The third layer consisted of five small sonic events specifically located in relation to the text. They're very quiet, except for the ducks at the end of the piece. I remember the work put into that little bit - the quick fade-in at just the right moment so the 'quack-quack-quack' sat just right. The recording date was 9 November 1987. Some years later, I dined with a group of people at a friend's house. Also at the table was another composer (more aligned to standard notation and conventional instruments) and his wife. In the course of the conversation, he told me how much he'd enjoyed my sound installation with the little cars that struck the suspended percussion objects. When I told him that I'd never built that installation, and that it had only ever existed as a verbal description on a cassette, he was shocked and adamant. "Darling", he said to his wife, "you remember seeing Ernie's installation with the little cars, don't you?" "Oh yes" she replied, "it was delightful!" I can conclude two things here: either the suggestive power of the spoken word is hypnotically great; or somebody else built my work and I didn't get to hear about it! FOR TWO ON BLUE was first performed by Ernie Althoff and Warren Burt in May 1987 for the Malvern Community Arts Festival. The venue was the Upper Foyer of the Malvern Town Hall which, in those days, had a floor covered by a gracefully old but still beautiful blue carpet. 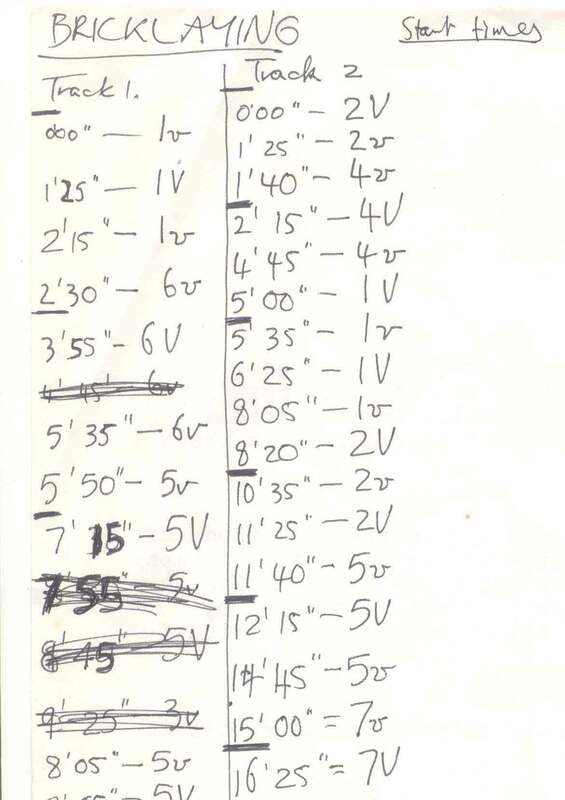 In September 1987 the score was reorganized to facilitate multi-track recording for stereo broadcast. The piece descends in pitch level as the second and third textural sections are introduced over the initial material. The environmental sounds were recorded on the banks of the Yarra River at Fairfield part in one take. Ernie Althoff: tape, harmonica, found objects, sampling and synth programs, machine and instrument design and construction. Warren Burt: windchimes, found objects. SATURDAY STORIES was originally requested for an ABC Saturday morning AM radio program and was recorded in November 1987. Controversy arose over the text however, and the piece was not used for its initial purpose. In some ways this rendered aspects of the text redundant, and the same problem is evident in this cassette version. Despite this, I feel the piece has many other features which keep it a topical listening experience. 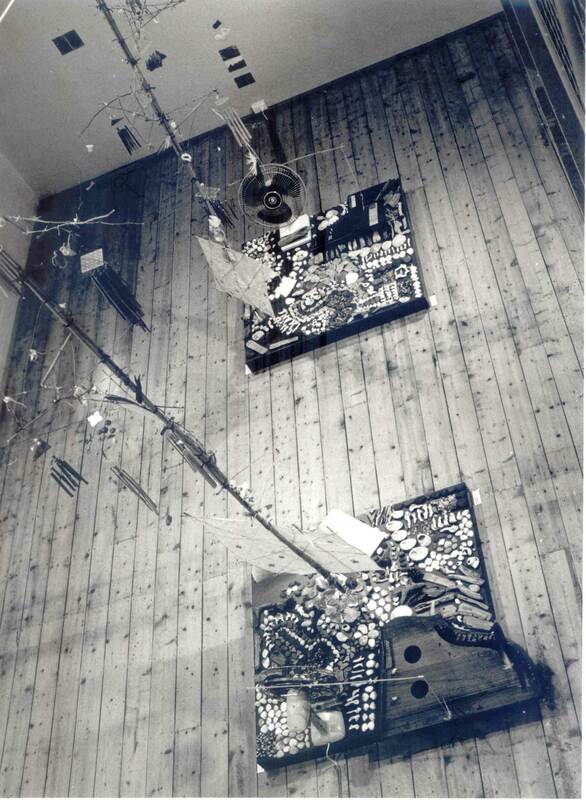 Ernie Althoff: voice, tapes, found objects, sampling synth, machine design and construction. Both pieces were recorded at the Australian Broadcasting Corporation's Waverley Road Studio 325, with production by Althoff and Burt. The recording engineers were Philip McKellar on FOR TWO ON BLUE, and Peter Thorp on SATURDAY STORIES. Grateful acknowledgement is made of the ABC's assistance in their production. The pieces were broadcast in stereo on the ABC-FM's Audio Spectrum program in November 1987. On the day that I collected the finished copies of my Music for Seven Metal Machines cassette from the factory, I received a cheque in the mail from the Australia Council. This was a first use fee payment for the work "Searching high and low", performed by a quartet on 22 July 1990 at the Linden Arts Centre, St. Kilda. With this money, and the advice of a sound engineer colleague, I purchased two good quality cardioid microphones suited to the percussive timbres I was working with. Now my little four-track cassette based home studio was complete. I set to work. Previous cassette releases had featured one long piece per side. I now deliberately chose the 'many small tracks' format. I think the figure thirty came fairly early in the process. I remember getting the recording done for most of Side 1 and a couple of tracks on Side 2 by the end of 1990, but it became obvious that a finished thirty-track product was not going to appear any time soon (as it turned out, I wasn't able to resume this project until the second half of 1992). 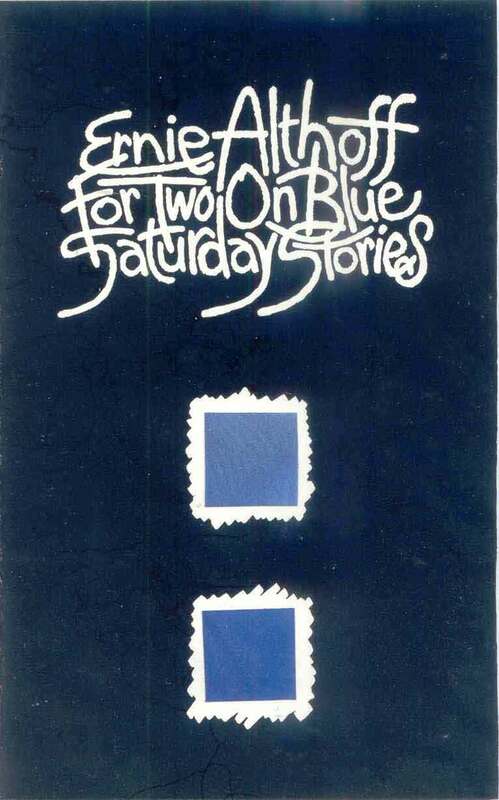 I had to content myself instead with the release of For Two on Blue/Saturday Stories (both recorded in 1987) in October 1990. You will notice in the following track notes that many tracks are 'audio spin-offs' from other projects that occurred around this time. Note - only 29 tracks are included in this online and CDR reissue, due to tracks 10 & 11 running into each other, and thus presented here as a single audio file. 1 - Triple tine. A small music box with the tine-set unscrewed and inverted to play something else (thanks Warren). Recorded at three slightly different speeds and panned left, centre and right. 2 - Wind quartet. Close-miked breathing in a paper bag, recorded four times at slightly different speeds and panned. I got very dizzy recording this one! 3 - La Corona, I love you. A work I performed several times was my version of Russell Hoban's set of stories La Corona and the tin frog (See Art Network 6, (Winter 1982) p36 for a description). 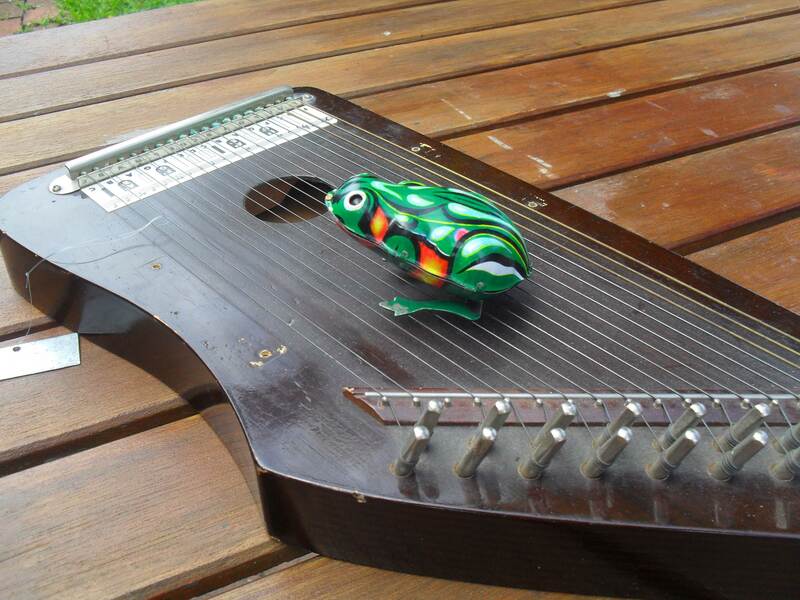 The player here is a wind-up tin frog jumping on the strings, and also the wooden back, of a small zither. 4 - Shake the piano. A very cheap ten-note toy piano used in an unorthodox way - piano as tambourine! 5 - B-52. A 13-bar bamboo wind-chime recorded up close, four speeds and panned (13 x 4 = 52). 6 - Double auction. Two art auctions recorded in stereo and mixed. It works because the venue (and so the room-resonance) was the same for each. 7 - Oscar's binary song. A reference to the glass church in Peter Carey's book Oscar and Lucinda. Two small blue-glass antique tablet bottles used as wind and percussion instruments. 8 - Bounce 1. Soft mallets on a centrally-mounted concrete cutter disk. Two plastic 35 mm film canisters tethered with fishing line bounce near the outer edge and provide the funny little warbles as their resonance spaces open and close. 9 - An extended sentence. Chris Mann gave me the letter-additive sentence, but three words (not the last ones) were missing so I had to do a bit of research to complete it. It's quite difficult to listen to yourself on headphones and simultaneously run a verbal commentary (Chris liked doing this). Using a different timbre helps a bit. 11 - Machine No. 106. Both these tracks feature machines whose sound source is a rotating 50 cm dia. plastic lid for a computer magnetic tape spool. There are various equally-spaced ridges and grooves on the inside surfaces which are utilised for percussive effects. In addition, selected parts have been recorded at a different speed for a phasing effect, so the audible 'machines' are not just the physical machines. 12 - Slouching towards Jupiter. This is a realtime performance with a faulty CD player (when they were still regarded as perfect). Load the CD (Holst's The Planets), grip the player between the knees as one might a set of bongoes, and tap the CD drawer front on the left for a skip in one direction, and on the right for a skip in the other. Lightly for just a little skip, and harder for a bigger one. Just enough control! 13 - Minimula. This title is an inaccurate reversal of the word 'aluminium', and that's what the track is. Nine-pitch tubular chimes reversed, with a little bit of reality at the end (palindromic form?). 14 - Cindy spins. In October 1990, Warren Burt and I devised and performed music for the Hellen Sky Dance Company's In Transit at the Beckett Theatre, Malthouse complex. I also devised some sounding objects for the dancers, including metal disks spun on their edges and slid across the floor. 15 - Tops stop. That wondrous aerophone, the musical spinning top! Recorded in three sections to accommodate the dynamic levels. The slow-down is effected by blowing through a thin plastic tube at the sounding vents. 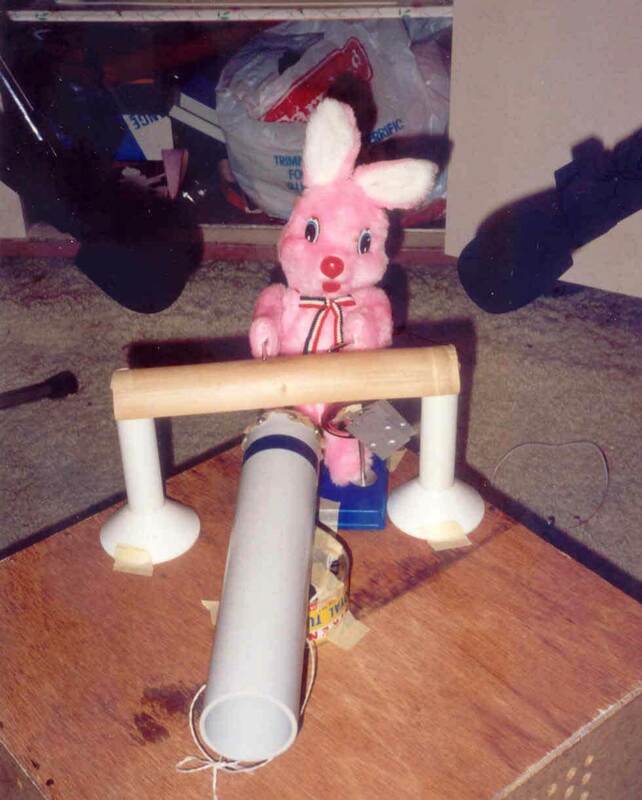 16 - Rabbit kit. 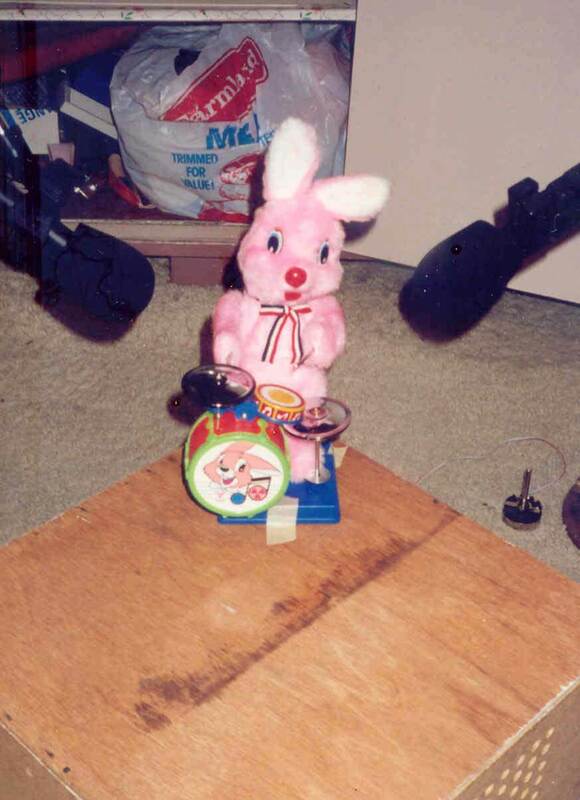 This is a sitting-down version of the battery-powered drumming rabbit, customised with a speed control as well. The track fades between the trap-set out of the box, and another I built myself. 17 - Happy apple. I've still got this solid Fischer-Price tine toy. The rugged outer case protects the sounding elements and amplifies them too. Strumming on the grille of an electric fan provides the backing. 18 - All that glitters. In January 1990 I performed a piece with this title at the Universal Theatre in Fitzroy. The work involved actions at the four corners of a square and at its centre. This track is a deliberately low-budget 'fake', to see if position could be emphasised within the home-stereo environment. 19 - A.M. My Sansui tuner has a big tuning dial that's very easy to spin and cause stations to flicker in and out of signal. Four recordings of this process. The word 'hundred' leaps out suddenly. 20 - 1-2-3-4. 33 1/3 vinyl: J.J. Cale, Status Quo, Duster Bennet (British one-man-band blues player) and a Jamey Aebersold jazz education LP. Shame I didn't put The Ramones in there, too. 21 - Hum. Controlled feedback from crossed ins and outs on a Sony reel-to-reel tape machine that had an amp and stereo speakers attached. Too heavy to lug around - cassette recorders weigh much less! 22 - An exercise in harmony. What is documentation? What does it mean? 23 - Titchy. A four-track mix of little 'slide-drums': a drum head of 40 mm diameter is attached with self-tapping screws across the top of a pvc tube that fits snugly inside another pvc tube. One player does the drumming, and an assistant manually slides the tubes in and out to alter harmonic content. 24 - A glass of water. Mouth percussive sounds that really make the title necessary! The bass is made by rolling a six-sided pencil back and forth on a drum head. 25 - George and Martha installation. This is the only non-four-track work of the set. It's a stereo recording of a kinetic sound installation shown in September 1990 at the Meat Market Craft Centre, North Melbourne. 26 - Spooky. I needed assistance to record this one. A number of rectangular aluminium slab-gongs, struck with a soft mallet near the edge so as to cause spin and the associated tremelo effect. The assistant released the pause button after I'd struck the gong, then turned the tape-speed knob to create the swooping pitch changes for each strike and faded out at the end. Four recordings, mixed. 27 - San Jose thunder. An American friend sent me the stereo tape in the mail. This version has three takes lagging slightly behind each other to prolong the thunder peals. 28 - Bounce 2. Table tennis balls bouncing, and then rolling, in small wooden bowls. Multi-tracked. 29 - Lombox. 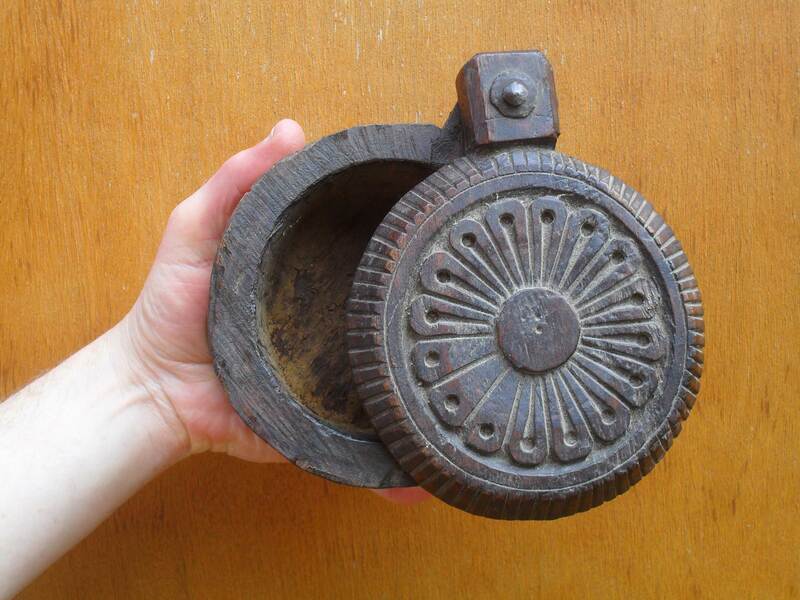 The instrument used here is a small round wooden box with a pivoting lid that came from the Indonesian island of Lombok. The box is held so the lid can swing back and forth across the opening. Sounds somewhat like an old washing machine! 30 - Low-tech. Mono-syllabic words loaded into the sampling function of the Casio SK-1 keyboard, the keys then used to shift pitch. Careful timing across the four-tracks of the recorder. ...to end like this! An edition of 100 cassettes was finally released in December 1992. I made 100 little collages (each with a background, a 'stripe', and some floating objects) for the covers. I sold a few, swapped a few, gave away more as promo, and the rest languished. In 2009, Shame File Music sent a couple to Vox Cyclops in Newcastle, NSW. This kindled a renewed interest, and the last copies sold out in mere months. My gratitude is extended. This sixty-minute cassette is a response to my previous cassettes each having one long piece per side. Nearly all the pieces here were made with four-track cassette recording and mixdown technology. One is a straight stereo recording of an event outside the studio, and two were made with low-budget digital devices. Work started in November 1990 and finished in September 1992. Obviously, much also happened in between to distract me. Each cassette has its own individual coloured collage for a cover, so perhaps one could see it as a free bonus cassette with an inexpensive work of art - unsigned by so tastefully framed! -"Kerosene replaced by gas" and "Freeform vocal trio for handheld instruments (IDA)", New Music 1978/79 (LP), Innocent records NON-007, 1980. -"You underestimate my powers of perseverance! ", Tape (Decisions) (cass), Rash R-004, 1982. - "Metal motor music" (IDA), Art Network music supplement (Flexidisc), in Art Network Issue 6, AN-001, 1982. -"Music machines", NMATAPES 2 (cass), NMA , 1983. -"Any questions? ", NMATAPES 5 (cass), NMA, 1987. -"Music machines", From the pages of Exp. Mus. Insts. Vol 2 (cass), E.M.I., 1987. -"Foolin' around" and "Vocational guidance", Mixed doubles (cass), NMA, 1989. -"The long and the short of it" (exc) (IDA), NMATAPES 7 (cass), NMA, 1989. -"51 flexibles for gramophone users", Anthology of Aust. music on disc (CD), Canberra School of music, CSM-6, 1989. -"The bamboo orchestra", From the pages of Exp. Mus. Insts. 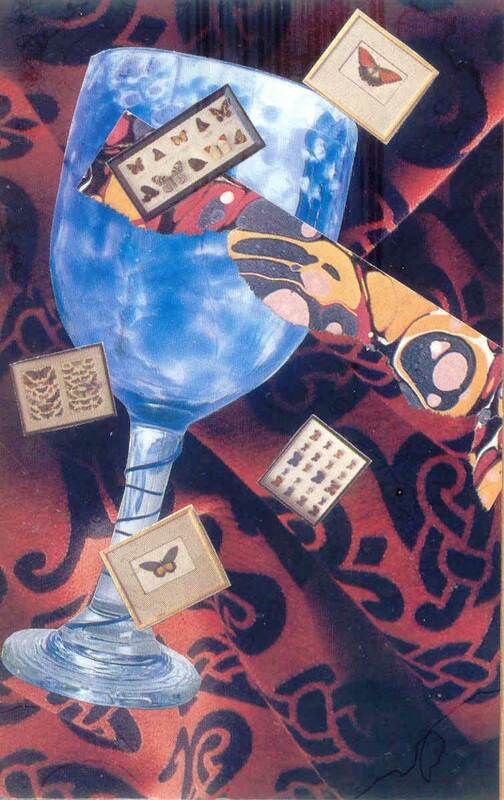 Vol 5 (cass), E.M.I., 1990. -"Percussion muzak" (exc) and "Aluminium gongs (The committee band)", Best seats in the house! (cass), NMA, 1992. -On Marine Lives (cass) by Robert Jackson, 1992. Player on trio improv titled "R.D.O." - On Victoria returns the compliment (cass), ABC/indep., 1993. One solo and one duet with Robert Jackson. -"Speleology", Piano miniatures (CD), Red House Editions, RED 9401, 1994. -"Uncopyrightables" Sound and action poetry (cass), Axle, 1994. -"Tea party", "Currawong bush park installation" and "In the corner", Sound in space (CD), Museum of Contemp. Art, Sydney, 1995. -"Best intentions" (EA and G. Davis), Frog Peak collaborative project (CDx2), Frog Peak music, U.S.A., 1998. -On Voices - the SANE Aust. Auditory Hallucinations Project (CD), SANE Aust., ISBN 1 875182 35 7, 2000. -"Balanced beams" (Tk 17) and "The white room" (Tk 29) , CD with Sound sculpture - intersections in sound and sculpture in Australian artworks (Bandt, R), Fine Art Publishing, Sydney, September 2001. -"Wolff at the door" (Tk 2), Gating (CD), West Space Inc., Melbourne, 2002. -"The west wall" (Tk 1), Ohrwurm (CD-R), Ltd ed., 2002. - "Declivities" (Tk 4), Liquid architecture 5 (CD), RMIT Union, Melbourne, 2004. -"Area" (EA and R. Avenaim), (Tk 1), Outer 05 (CD), Bus Gallery, Melbourne, 2004. -"The emergence of mammals" (exc) (Tk 1), Loose canon, Australia Council 2CD promo set, 2005. -On Tape Projects TAPR06 (No title), Vinyl record of 60 lock-groove tracks, Tape Projects, Melbourne, 2008. -"David and Frederick" (Tk 6), Soundcapsule 1 (mp3 download compilation), Realtime Arts, 2009. -"Solo to trio" (Tk 4) and "Solo to group" (Tk 8), S3D ear & eye (CD and DVD pack), ACD 609, Atoll, N.Z. 2009. -"MeMoMu (IDA: EA & GD)" (Disc B, Tk 14), Artefacts of Australian Experimental Music Volume 2: 1974-1983 (2 CD set), Shame File Music, Melbourne, 2010. -"Front Row" (1993), performed live by Decibel, Perth 2010. -"Jila 9", The Shape of Sound Volume 2 (CD), Iceage Productions, ICE011, Melbourne, 2011.